Notes: Sale: Triton X, Lot: 244 Very rare. 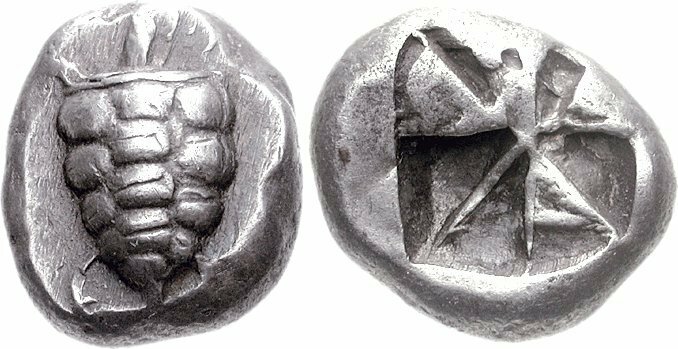 Ex Numismatic Fine Arts XXV (29 November 1990), lot 111.This coin is part of an early series of Aegina that was originally attributed to a mint in Cydonia (E.S.G. Robinson, “Pseudoaeginetica,” NC 1928). Holloway’s landmark study of the early Aeginetan coinage conclusively moved the series to its correct source. The proto-tortoises appear in two varieties, one with a “T-back” shell and another with the segmented shell, as here. It appears that the “T-back” varieties were produced in large quantities, as indicated by numerous specimens struck from very worn obverse dies. In contrast, the known segmented shell specimens, fewer in number, usually are found to have been struck by very fresh dies, suggesting they had a limited production for some special purpose.